Cool! "Real sceners make real graphics" :D Awesome graphics here indeed, good work you criminals. :D Very nice to watch. For the "destruction of public property" the recipient is fined 6000 NOK (~756 EUR) with the option to instead spend 12 nights in jail, . In addition to that, 17 spraycans and 2 sketches for a "tag" (sic) was seized "for the benefit of the norwegian state". hmmm.. effects are slow as hell and there is also exactly ONE "real graphic" in here.. so what?! No ps 2.0 support here. well, some graff pic (no s). 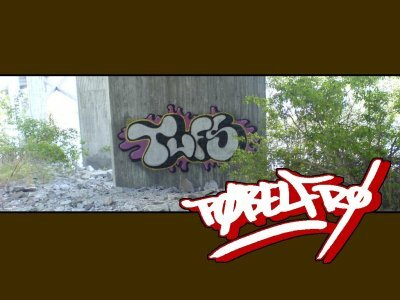 Dodge:Agree with the font thing ;) lets hook up and do a co-op with some real graff stuff. dipswitch: the demolition engine needs ps2.0, I dont know if gf4mx has that? and the demo has some effects using pixelshaders aswell :) hehe. clearly a fast prod. proteque: please let panta know that this demo suffers from the same audio-problems as he has already fixed with his latest prod. huh where are the overwhelming graphics ?? the track sounded kinda nice, but the rest was just nyeeeh. gargaj: well. thats why it is called "pøbelfrø". Translated to english it is something like: "gangstahnewbie". www.vandalsquad.com ???? Whats your point? That site is an insult to trainwriters. "Moods Plateau - Key to success"
Need the audio fix here (NForce 2 on board audio), pleazzzzeeee ! haha, the lyrics in this soundtrack is really cool. is it homemade or ripped?